The high ground of Sydenham Hill forms the watershed between the Pool and the Effra, known locally as Ambrook River, there are numerous springs on both sides of the fluvial divide; Running Past will be following those heading broadly east south east towards the Pool. The first of these posts has a source around 500 metres from the edge of the Pool’s catchment on the small protuberance of the appropriately named Peak Hill. Some maps mark a small pond in what would be the playground of St Bartholomew’s Primary School, although it has never been obvious on current or past Ordnance Survey maps, present day satellite views of the area or from the road. However, that area would seem to have been the roughly the source of the stream. 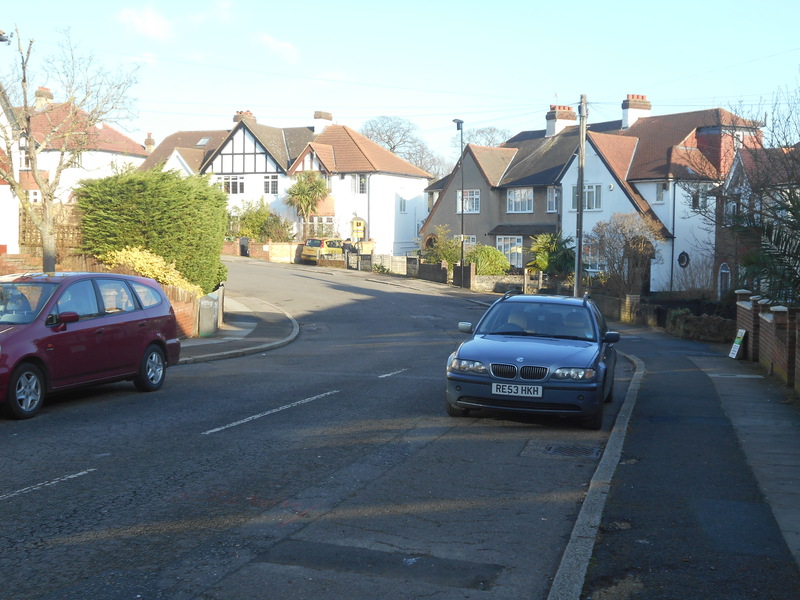 The first obvious hint of stream is a dip in road as Sydenham Park Road (above) bends sharply to the north east close to a turning to The Peak and the likely original source. The original flow would have taken the nascent stream through what are now gardens before emerging into a clear dip in Silverdale around Paddock Close. The gap between the two roads is little more than 120 metres, but what lies betwixt the two will have changed the stream’s flow – firstly the short-lived Croydon Canal (opened in 1809) and then its successor the London and Croydon Railway will have blocked the passage. Unlike some of the other streams coming off Sydenham Hill to the north of this, it seems likely that the flow continued under the railway as a series of ‘water features’ continued along the stream’s route when the Ordnance Survey surveyors visited in 1863, see above (1). After a line that takes in some garages the hint of a shallow valley appears in the green flagged Mayow Park, particularly at the southern end facing onto Mayow Road. 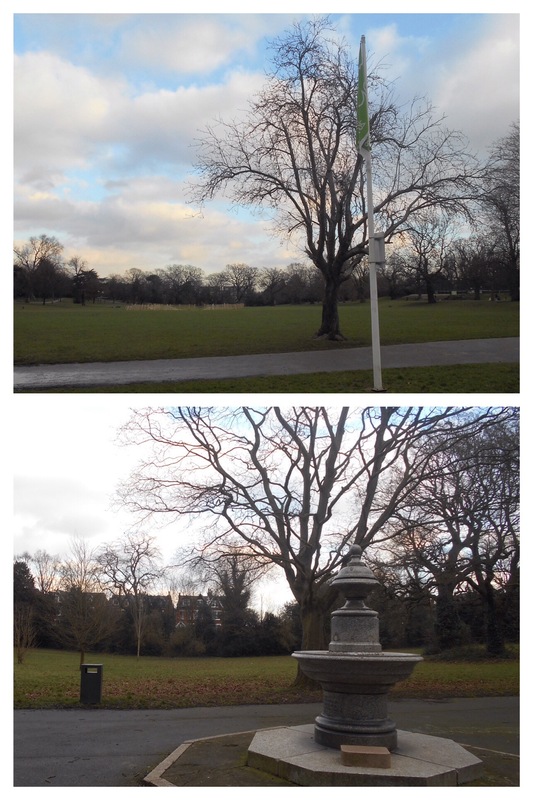 The Park itself dates from 1875 and was created by public subscriptions from the great and the good in the area – particularly Mayow Wynell Adams. It has a rather grand drinking fountain remembering the Reverend W Taylor Jones – another of the benefactors. 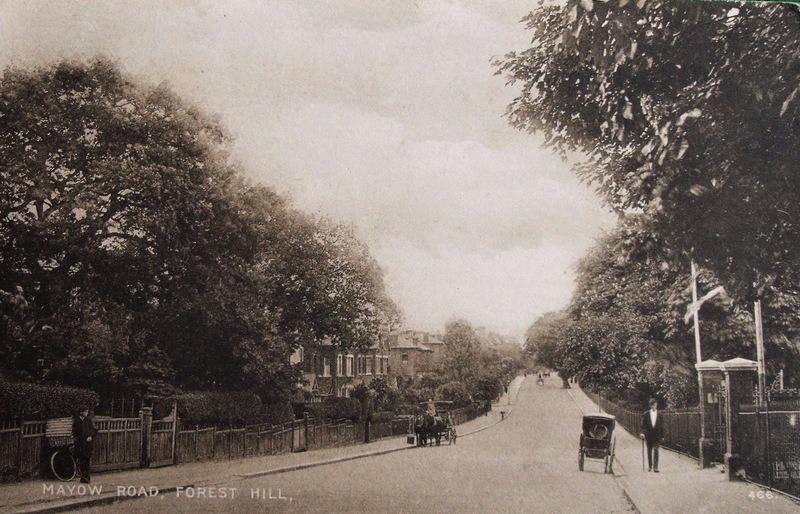 Sydenham and Forest Hill Recreation Ground was part of a Victorian movement of trying to allow the ‘less fortunate’ to take the air. As was noted above, the 1863, post canal and railway, Ordnance Survey map suggests the stream was still flowing at the time the surveyors visited so the culverting was probably when the Park was created. The stream crosses Mayow Road (see above – (2)) in a very clear dip where water often collects after rain and then heads off down Adamsrill Road in an obvious valley, initially, at least, with paths to back gardens on the right being upwards as is the incline on Niederwald Road. As the ‘rill’ in the street name is one of a myriad of names for a stream and the Adams prefix will have related to the local benefactor Mayow Wynell Adams, it is not unreasonable to call the stream Adams’ Rill. The geographical pedant may dispute the appropriateness of calling it a ‘rill’ though as in relation to ‘hillslope geomorphology, a rill is a shallow channel (no more than a few tens of centimetres deep) cut into soil by the erosive action of flowing water.’ The size of the small valley as the stream heads down Adamsrill Road is considerably deeper than this. 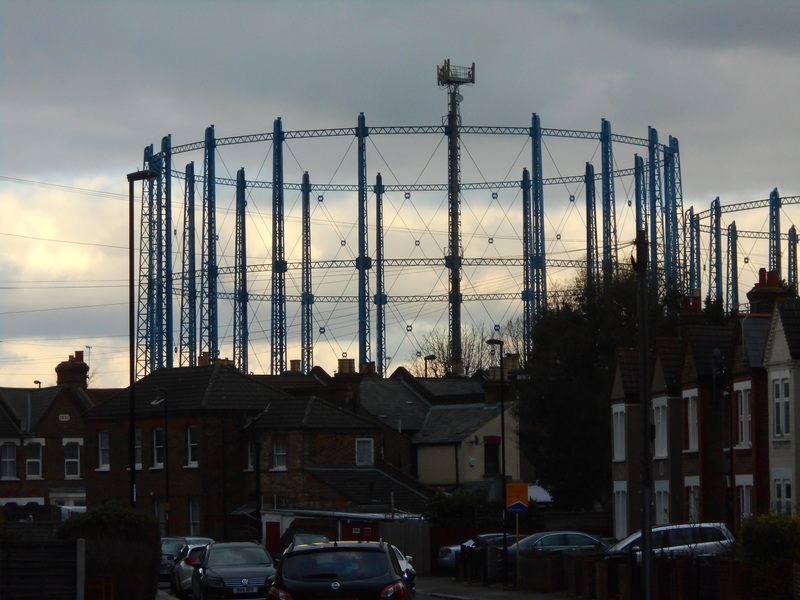 As Adams’ Rill continues down the eponymous street, the locally listed gas holders Bell Green dominate the view. The gas works have been there since the 1850s, it ceased to be operational as a gas works in 1967 although it was not until 1995 that the first retail unit, Savacentre (now Sainsburys) opened on the site. 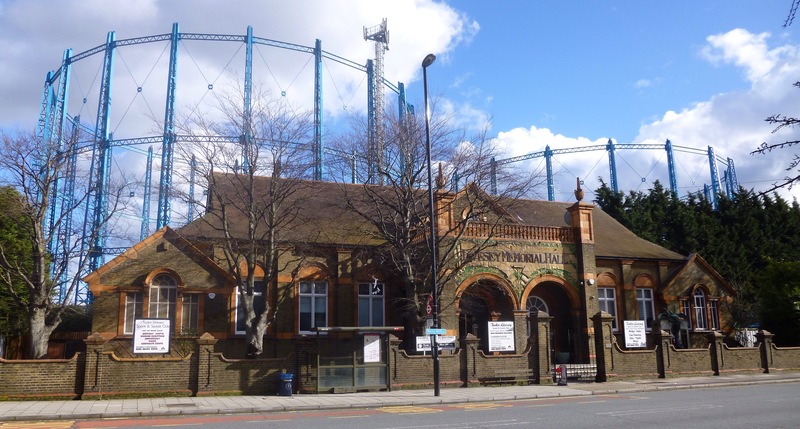 Other than the gas holders the only remaining part of Bell Green’s gas producing past is the works social club, now called the Livesey Memorial Hall (below). 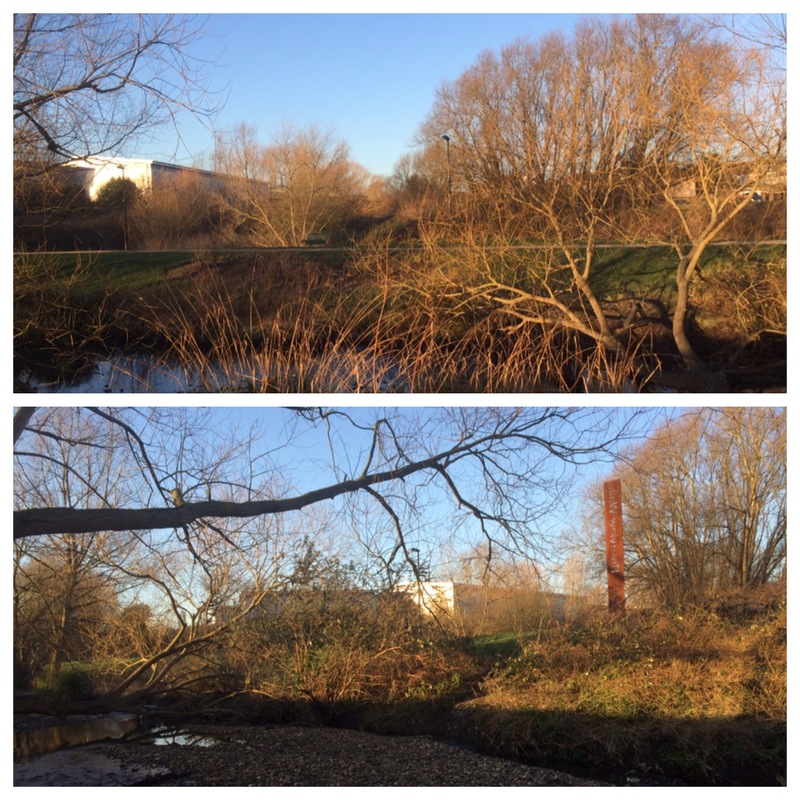 The exact route the stream took to the River Pool is not clear – the gas works obliterated the contour lines. However, on modern 1:25,000 maps there is an upward pointing contour line to the north east of the gas works (now a retail park) site, it contains a small pond – often complete with fishing heron. It is just possible that the the pond is the last remnant of Adams’ Rill and that the stream is still just flowing. The confluence would have been roughly at the location below – although as the current river landscape was constructed in the mid-1990s after the Pool was taken out of its concrete casing under the gasworks, it is doubtful that it ever looked like this when Adams’ Rill was flowing. This entry was posted in Lewisham History, Rivers and tagged Adam's Rill, Adamsrill Road, Bell Green, Mayow Park, River Pool, Sydenham on February 14, 2018 by Paul B.